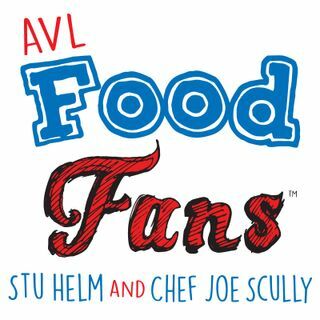 In part one of this episode, Stu is joined by Chef Jimmy Lee, from El Kimchi Food Truck, and Buxton Hall Barbecue, who talks about everything from picking his own first name at 4 years old, to growing up in a nursing home! Next Chef Joe Scully from Chestnut, Corner Kitchen, and Corner Kitchen Catering comes in to discuss a topic with Stu: The Great Eagle's 2nd annual Let's Taco Bout It competition, at which Joe and Stu were both judges! In the final segment, Stu is Joined by Asha ... Maggiori informazioni Hertel & Chef Josh Dillard, both from the very unique and deservedly popular Bhramari Brewhouse on Asheville's South Slope. Another great show, brought to you by WPVM 103.7fm, Mojo Kitchen & Lounge, Aloft Asheville Downtown Hotel, and Takeout Central. Theme song by the Derita Sisters.